Faith Based Marketing Specialist Spencer Fehrenbacher is hitting the road for another Rock and Worship Roadshow, only this time he’s got a new travel partner in Stephanie Cashin — and the effort will be bigger and better. “It’s all about the power of the sun and our beautiful campus,” says Cashin, who will be with Fehrenbacher on a seven-week, 26-city tour covering 17,000 miles, starting Thursday in Biloxi, Miss. This time, the travelers will use iPad technology. While Fehrenbacher mans the concourse booth in arenas on the Christian music tour, Cashin will circulate among the fans, providing prospective students the opportunity to check in with Trevor Roberts, who will be posted on campus. Spencer Fehrenbacher and Stephanie Cashin are hitting the road with the Rock and Worship RoadShow. Fehrenbacher and Roberts were on the road together last summer, working the festival circuit. According to Fehrenbacher, that isn’t the only change for this tour. Faith Based Marketing will have a second booth in the arenas, decked out in GCU tablecloths, more iPads for collecting information, brochures and other collateral — all lit in a can’t-miss purple glow. Youth pastors in attendance will have an opportunity for a VIP backstage experience, meeting band members and hearing from GCU UDRs and volunteers about what the University has to offer. The pastors will learn about Discover GCU events specifically for prospects who attended the Rock and Worship Roadshow, and there will be incentives to bring high school seniors to Phoenix to visit. GCU student Moriah Peters also will be on tour, helping out with the arena setup and performing as the Lights Up Act as fans enter the arena to find their seats. MercyMe again will be the tour’s headlining act. The popular Texas-based band will be joined by Tenth Avenue North, Disciple, Lecrae, Hawk Nelson, Rend Collective Experiment, Bart Millard and Sidewalk Prophets. The tour will stop at US Airways Center in Phoenix on Friday, Feb. 24. For the Rock and Worship website, click here. 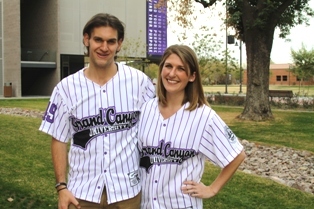 “We really hope for a large GCU presence at the Phoenix show,” Fehrenbacher says. Tickets to the show are $10 at the door, and seating is general admission. Contact Jennifer Willis at 639.7383 or Jennifer.willis@gcu.edu.